Yes, I'm still working through Cosmoprof polishes! This one is by Serum No. 5. This is my first polish from them, but I'm very familiar with the brand as I've been oogling over their polishes for a long time. This polish is definite oogle worthy! Power is a clear blase filled with a rainbow of multichrome micro flakies. Color: Wow! This is perfection. I love the rainbow of color-shifting flakies in Power. 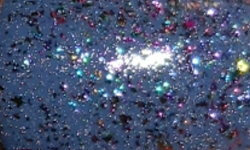 This shiny, sparkly, and color-shifty (hehe)! This is stunning. I don't have much else to say about that. Formula: Top notch. I love the size of these flakies. They're teeny which gives you excellent coverage. I used one coat above and this was a breeze apply. You can see the great coverage I got in only one coat. Price: This is $14.50 on Serum No. 5's website. Overall: Power is a beautiful flakie topper. I love the rainbow of colors and the multichrome effect. The formula is spectacular and it's just an all around winning polish! Happy Thanksgiving tomorrow to all we celebrate!